1,738 sq ft; lot: 1.49 acres - MLS# 1630685 Courtesy of Shorewest Realtors, Inc.
Time to make this lovingly cared for home yours in the sought after Hamilton School District. Generously sized living spaces are perfect for easy living, entertaining or relaxing. 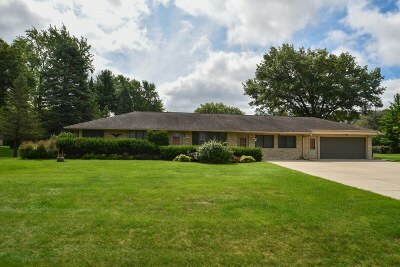 Ranch style, with all three bedrooms, baths and laundry room on one main level. Many thoughtful updates and upgrades, most recent include: sun porch, huge composite deck, Sunsetter awning, furnace, hot water heater, whole house Generac Generator (12 circuits), washer and dryer. Kitchen offers a great working space with plenty of cabinets and drawers and newer floor. Quantity and placement of windows was well thought out, quality Lannon stone exterior, two sheds for additional storage and fantastic, private 1.49 acre lot.